Fish dishes that always served in almost every wedding party. Covered with flour and crispy fried then poured with sweet sour sauce, will always be a crowd's favorite. Wash the gurame and fillet. Slice the fish meat, season with the ingredients. Take the fish in the refrigerator and coat with flour until finely covered. 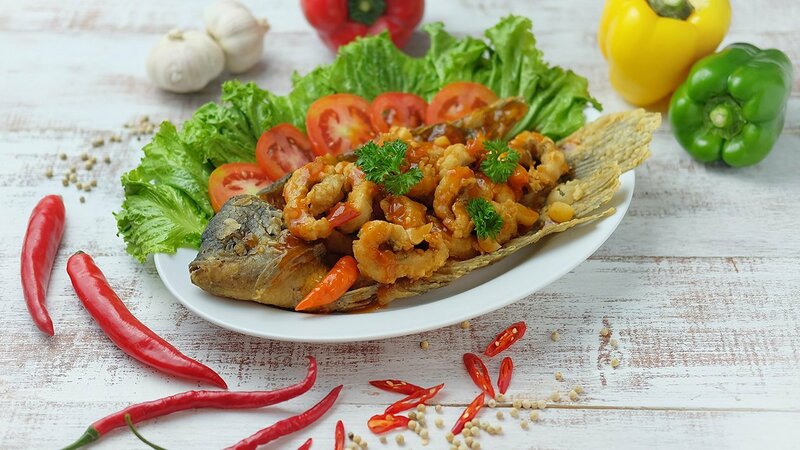 Heat oil, fry the coated fish. Prepare all the spices above as directed. Heat the oil, fry onion and garlic until fragrant. Add the green paprika, red paprika, and ginger. Add tomato sauce, chilli sauce, pineapple, Knorr Bumbu Pelezat Rasa Ayam Rostip, and tomato. Prepare gurame on a serving plate. Baste with sweetened sour sauce.